Projects involving Science, Technology, Engineering, and Math (STEM) encourage skills such as problem-solving, teamwork, and critical thinking in children. These tools are necessary in our world of ever-changing technology, and they prepare students for higher education and careers. Here are the top 5 ways that parents can encourage STEM learning at home! Is your child always asking “why”’ and “how”? That’s a STEM mindset—and it can be the beginning of a drive to solve important challenges like protecting our environment, curing diseases, or engineering new clean energy technology. Even if the questions seem relentless at times, embrace this curiosity. Take the time to explain the things that you understand, and when your child poses a question that you don’t have an answer to, look up the answer together (and model good research practices in the process). Who knows—it may spur some new interests for you too! TV and movie time doesn’t have to be mindless—there is plenty of entertaining programming out there that is strongly related to STEM fields and educational in the process. So, the next time you and your child are browsing Netflix together, give the “documentaries” section a look. Long-running programs like the History Channel’s Modern Marvels, PBS’ NOVA, and the Discovery Channel’s Planet Earth are tried-and-true favorites with hundreds of episodes covering a variety of topics, such as civil engineering, space exploration, and evolution. If those shows are a little too much to hold your child’s interest, there are also plenty of kids’ and primetime television shows that have more of a STEM theme than you may expect. Sid the Science Kid is a great option to spur a science interest in early learners, while shows like CSI or Numb3rs, both of which focus on real-world applications of forensic science and math to solve crimes, can spark an interest for older students. What better place to allow your child to get up close and hands on with science than a science museum? And they’re not difficult to find. There are over 150 science centers around the U.S., and about one third of those even have areas designed specifically for children six years old and under. These museums typically include a variety of exhibits that explain complex and fascinating science and technology concepts in creative and accessible ways—giving visitors the chance to run their own experiments, play with gadgets, or check out live and video-based presentations. So, plan a weekend outing to your local science museum, or check out this list of the 10 Best Science Centers, and think about working a visit into your next family vacation itinerary. Most of these institutions have great websites with additional resources, activities, and ideas to inspire STEM interest as well. Extracurricular activities, even for young students, don’t have to be limited to sports or performing arts—there are plenty of STEM-based options too. There are numerous science fairs and engineering design competitions that self-directed students can seek out. For students wanting more guidance or a social aspect, math and science competitions are hosted across the country by various organizations (like Science Olympiad). Think of these competitions as a team geography bee for math and science, complete with practices to prepare. The FIRST Robotics and Junior FIRST Lego® League programs have also grown very popular in recent years. These competitions challenge teams of students to solve real-world science and technology problems by building robots with the mentorship of an industry professional. It’s projected that over 400,000 students in grades K–12 will participate in FIRST (For Inspiration and Recognition of Science and Technology) programs during the 2015–2016 school year. One of the most important actions in fostering an interest in STEM is showing children where it can lead them. So, make an effort to expose them to different options for a career in STEM. If you’re in a STEM field yourself, bring your child to work with you one day. Have friends or family members in a STEM field? Ask them to talk to your child about what their jobs are like, or even set up a job shadow if your child has a strong interest. There are also programs available in many school districts to match students with mentors or internships in various job fields, including STEM ones. If you’re unsure of where to start looking, Pathways to Science maintains lists of STEM internship programs for K–8 and high school students. Thank you to gettingsmart.com for contributing this week's top 5! Work out what’s scheduled for your child and make a family plan. Consider creating a calendar or weekly schedule that helps to remind everyone about what’s going on that week and what your child needs to take to school each day, e.g. library books that are coming due and school sport days. It’s not uncommon for parents to allow their children to stay up later during the summer holidays. To ensure that your child gets up in time for school, it is important to re-adjust your child’s sleeping patterns prior to the school term starting. Start by adjusting your child’s sleep pattern in small half hour blocks. For example, if your child is going to bed an hour later than they need too, then 10 days out from school start adjusting their bed time back by half an hour every couple of days, so that they’re back into the school sleep routine prior to school starting. Establishing consistent and persistent morning routines not only provides the opportunity for your child to develop self-care and independent living skills (e.g., dressing themselves) but also makes the morning run smoother. Consistent morning routines create predictable expectations for your child, which provides the opportunity for them to develop their independence skills and in turn their confidence. Additionally, it is important to create an after school routine that suits your family’s needs and situation. As always, consistency is key to any effective routine. So find out what suits you and your family and stick with it. For example, is it better for your family that you have a family meal together after homework is completed? Does your child need some “down time” before bath/shower? Creating visual routines can help to reduce stress and assist in creating smooth morning and afternoon schedules allowing people to remain calmer and households to run smoothly. Using a visual routine will allow you to refer your child back to the visual schedule to check for themselves what comes next in the morning or afternoon schedule and carry out that activity. Again this is a great skill to build their independence and self-confidence. You can find great images online, then just print and paste them into a picture schedule. Thank you to Emma Ballantyne, Senior Behaviour Therapist and Early Intervention Consultant, for contributing this week's Top 5! Summer is the best time for kids to catch up on reading. While everyone reads at a different pace, most counties require students to complete a minimum number of books over the summer months. For both enthusiastic and reluctant readers, this can be difficult to accomplish due to busy schedules and the chore of completing a preselected list. 1. Participate in a structured program. Bring your summer assignments into SpiderSmart, and teachers will collaborate with students to check every book off your list. Learning to set specific goals, as well as lay out the steps needed to attain them, is a critical skill that all students must learn. SpiderSmart encourages students to apply this skill to their summer reading lists by helping them budget their time carefully to read one book every week. Students will feel so proud and accomplished that they were able to complete their reading list with ease! Students don't just read books at SpiderSmart- they interact with them! The ability to read, analyze, and respond is essential and timeless. SpiderSmart's Reading & Writing Program is structured so that students read one book every week, and then we take summer reading to the next level by complete a writing assignment that complements the book. A combination of close reading and critical thinking exercises will build skills of expression that carry over into every subject! 3. Review with an instructor. Dive deeper into your summer reading by adding vocabulary, comprehension, and writing exercises to your books and completing them with a teacher! Every lesson at SpiderSmart includes one-on-one time with with a talented educator who will review your child's work thoroughly and holistically. This allows for personalized, workshop-style classes that cover everything from comprehension to grammar. One hour a week of individualized review with an instructor can make all the difference! 4. Learn to love reading. SpiderSmart's dynamic assignments get kids interacting with media on a whole new level. Exploring text in new ways will cultivate an appreciation for literature like never before. Relating to characters and situations through imaginative essay writing creates a closeness to the story that your child will yearn for. Your kids will be begging you for another trip to the library! 5. Return to a learning routine. It can feel like a cold splash of water when students return to school after the long, relaxing days of summer. Ease back into an academic routine by participating in SpiderSmart programs once a week. Light homework, hourly classes, and focused lessons are a great way to warm up for school and ensure that your kids are in the fast lane this year! 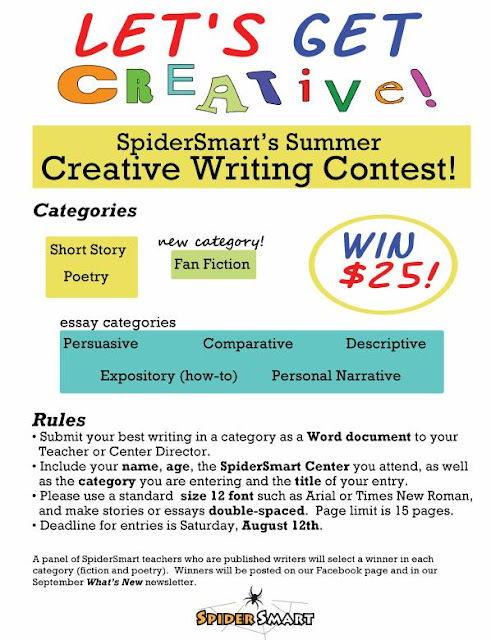 Did you know that SpiderSmart Learning Centers holds a worldwide writing contest for its students every year? Take a look at the categories and rules for this year, and enter your work! You can also take a look at our Top 5 Submissions from SpiderSmart's 2015 Writing Contest! We can't wait to read all of the amazing entries this year!